NEW YORK (CNNMoney) -- American manufacturing activity picked up in April, according to a report that showed the sector grew for the 33rd month in a row. The Institute of Supply Management's monthly index rose to 54.8 in April, from a 53.4 reading in March. Any reading above 50 indicates growth in the sector. The news was seen as a welcome surprise, given economists were expecting the index to fall to 53. Manufacturers reported that as new orders for their goods rose in April, factories ramped up production at a faster pace. They also hired more workers, a welcome sign ahead of the government's jobs report on Friday. "This month's increase is yet another sign that the U.S. manufacturing sector has been one of the most reliable sources of growth in the U.S. economy since the Great Recession ended," said Alistair Bentley, an economist with TD Bank. Gradual improvement in manufacturing has been a bright spot in the economic recovery. Manufacturers added 120,000 jobs in first three months of the year, according to separate data collected by the Labor Department. That said, factories also noted some jitters about the economy going forward. "Comments from the panel generally indicate stable to strong demand, with some concerns cited over increasing oil prices and European stability," said Bradley Holcomb, chair of the ISM's manufacturing survey committee. Some respondents also noted that temporary factors like the warm winter may have given them an unusual boost at the beginning of the year. "Warm weather in [the] Midwest appears to have helped soft drink sales," a beverage executive said. 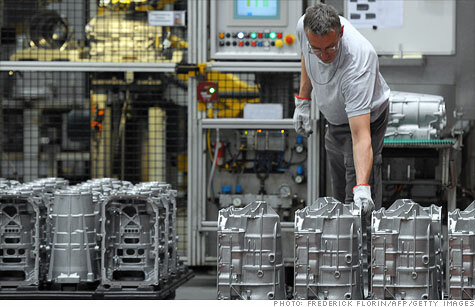 "The economy was off to a good start through the first quarter, but the European issues keep coming up as well as the recent disappointing jobs report," a metal factory reported. "It appears that some of the early gains may be temporary." Factories that make wood products were the only industry that contracted in April, according to the ISM survey.